Growing up in Boston, Matt Kepnes was never a big traveler. He didn’t take his first trip overseas until he was 23. Outside a cruise and college trip to Montreal, he had no travel experience. Then he went on a tour trip in Costa Rica, and got hooked on travel. He quit his desk job and decided to take a year off to travel. That was in 2006, the trip lasted 18 months, and Matt is still on the road. Since then, Matt has been showing readers of his enormously popular travel blog that traveling isn’t expensive and that it’s affordable to all. He proves that as long as you think out of the box and travel like locals, your trip doesn’t have to break your bank. 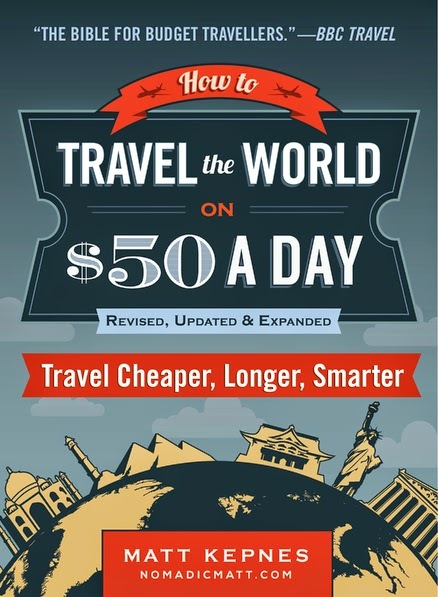 His definitive book How to Travel the World on $50 a Day (Perigee/Penguin Random House, January 6, 2015) gets an upgrade in this new revised and expanded edition—it still has Matt’s signature tips, tricks, and secrets to comfortable budget travel based on his experience traveling the world without giving up the sushi meals and comfortable beds he enjoys, but it also has brand-new content, including new chapters on China, Japan, and India. My Thoughts: I love to read travel books and learn tips & tricks from other travel-savvy people and thought this book was an excellent read! There were some things that I already knew but I would estimate that 55-60% of the book contained information that was new to me. It is a very easy read and Matt does a very good job at explaining everything in easy-to-understand terms. The entire book is broken down into chapters that build on the knowledge he is giving to you step-by-step. Since lodging is one of the biggest expenses when you travel, I found Matt's chapter "Tips for Saving Money on Accommodations" the most helpful to me. While I am not interested in "couch surfing" or "house sitting" I did learn a lot about how I can save money on lodging by using various online sites to bid on hotels and how to find cheap lodging deals online. Extremely helpful information!!! The book has chapters on: Europe, Australia, New Zealand, Southeast Asia, Central America, South America, China, India and Japan. If you are traveling to any of those areas, you will find some helpful tips in each chapter that will give you ideas on how you can save money while traveling. Overall, I think this Travel Book was a great read and I learnt quite a bit while reading it. You can purchase this book ----> HERE. Disclosure: Shelly Hill received a complimentary copy of this book to review on her blog and to present to her readers. No monetary compensation was receive. Shelly's words are 100% her own and she is presenting her unbiased thoughts and opinions.